Where are the oldest houses in Lockport? When the path of the canal over the escarpment was finally determined in 1820, land speculators scrambled to obtain the finest properties near the excavation line. The first structures were temporary, but soon, more permanent edifices rose from the landscape. So, are there still structures standing from the time before the canal was open, and if there are, where are they located? There are not very many buildings standing from the earliest days of Lockport. Time has a way of treating human endeavors rather badly if not regularly maintained. Progress and Urban Renewal also wreaked havoc with retaining some of our oldest homes and businesses. In 1960, Niagara County Historian, Clarence O. Lewis, did a survey of these old homes in an attempt to determine the oldest in Lockport. His articles are a starting point for the research to be done. Additional sources include looking through old land records and checking Common Council minutes for building permits and resolutions for moving structures. A great resource for determining whether a house is actually as old as their owners claim is the 1851 Map of the Village of Lockport. Surveyed and drawn by Bernard Callan, this map details all the structures present in the village for taxing purposes. If there is no building shown on the map, it wasn’t built at that time. It is a great piece of history that helps us nail down when neighborhoods rose. The likely oldest house still standing in the City of Lockport is located at 26 Bacon Street. Originally built by Almon Millard in 1820 or 1821, it was located near the southwest corner of Prospect and West Avenue. It was moved from there to its present location in 1880. It was known as “Millard’s White House” due to his proclivity of keeping it well painted. 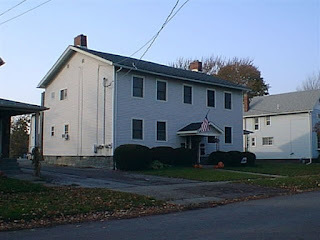 The next oldest house still extant is currently located at 7 Bright Street. It was originally built in 1822 by Gideon Hersey as a tavern, the Exchange Coffee House. It was once located at the northwest corner of Park Avenue and Hawley Streets, which today is the parking lot for the County Courthouse. It was in moved in 1910 to its current location, due to the impending enlargement of the county building. County officials announced in August that the Wicker residence (Exchange Coffee House) would be razed to make the lawn of the courthouse bigger and grander. W.E. Wicker was permitted to remain on the premises until October 1st. At that time, the contents of the barn would be auctioned off. The house itself could be sold off and moved, if necessary, and Supervisor Louis O. Fanck obtained the building with the intention of moving it to another piece of property that he owned. In the 1910 Common Council minutes, Fanck petitioned the Council that September to “move one frame building from the corner of Hawley and Park avenue, through Park Avenue and Ohio Street across West avenue through a field to Bright Street.” On motion of Alderman Willard Hurst, the request was unanimously approved. According to the 1851 map, this structure served as the Lockport Classical School. This school was first opened in 1831 on Main Street by James B. Chase. Within a year, the school has expanded so quickly that Chase purchased the Exchange Coffee House to house the bigger school. By 1859, the structure is listed for the first time as a residence for the Wicker family. 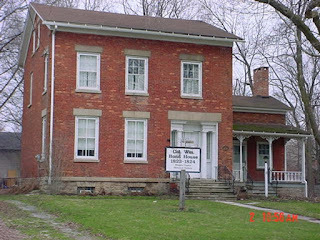 The first brick house in Lockport was built in 1823-24 by William M. Bond. He arrived in Lockport near the end of 1821. He bought some land from Esek Brown under the guise of building a glass factory to be advantageous to the growth of the village. Brown sold the land with that express purpose in mind and guaranteed in the contract. Ever the shrewd businessman, Bond got the clause vacated by Brown later and never built the factory. In 1822, Bond donated land to Niagara County to be used as a Public Square, where the current county buildings are located. The Bond House is located at 143 Ontario Street. It took over a year to build the house as the bricks were baked in ovens on site. It has six fireplaces. The fireplace in the kitchen was covered over during a renovation, and when it was uncovered, the old kitchen utensils were found inside. The main part of the house has four rooms on the first floor, four on the second, and three on the third. A wing where the kitchen is located has a bedchamber above it for use by a cook. There has been some debate as to the oldest stone house still in existence in the City of Lockport. A couple of sources declare a house at the east end of Washington Street is the oldest house. Built by Ezekiel Fulsom and known later as the “Cady House,” the earliest date I can prove is 1828. According to Margaret Truax, City Historian, the more likely scenario is the house at 124 Transit Road and the associated barn at 109 Roby Street. 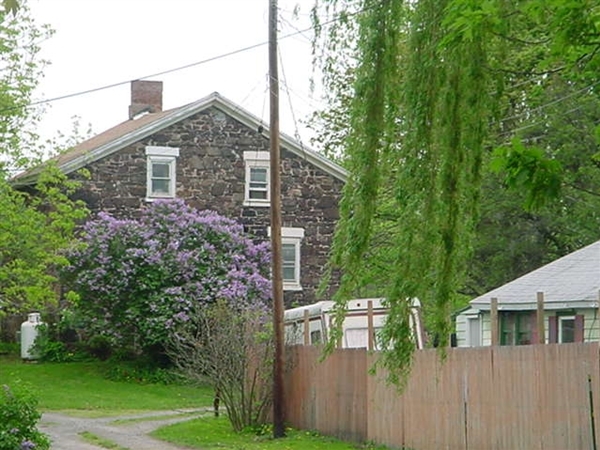 Both the Transit house and Roby Street barn are built on rubble stone quarried from the excavation of the Erie Canal. As for the house on Washington Street, today it is barely recognizable as a stone house. According to Joshua Wilbur and Clarence Lewis, the house was constructed from stone excavated from the hole made for the basement. 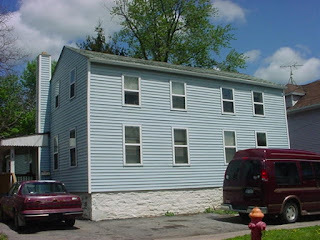 Sometime 1867-1869, Henry F. Cady purchased the Washington Street house, thereafter dubbing the residence as “Cady Cottage” or “Cady House.” It was a prominent feature at the top of the escarpment when coming up the canal. His business, Cady’s Boat Yard, was located nearly across the street from this house, in what is today Upson Park. In modern times, this house is barely recognizable for the historic structure that it is. There has been a lot of confusion with some people claiming to have homes that are older than they actually are. Much of this stems from owners looking at their title searches. A title search is for the property itself, not necessarily the structures upon it. For example, the earliest date on my title search dates back to the 1840s. That is the date that the property was first purchased from the Holland Land Company. My house was not built until March 1928. Sometimes the dates on the searches show when the land was subdivided, again, not indicative of when the house was built. Change in the form of progress or disaster has changed the man-made landscape considerably. While there are several homes dated from the late 1820s through the 1840s, most of the pioneering buildings have disappeared. Those left behind bear the memories of the pioneering spirit of the first residents of our City of Lockport, hardworking men and women who forged a life amid the forests, stone, and rattlesnakes of the Niagara Frontier. Craig Bacon is the Deputy Historian for Niagara County. The Historian's Office is located at 139 Niagara Street, at the corner of Niagara and Hawley. They are open Wednesday through Friday, 8:30am-4:30pm.